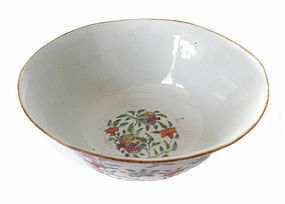 Beautiful antique Chinese porcelain bowl, underglaze painting of flowers, interior of bowl painted with pomegranates, six side foliate, Ching dynasty- Tao Kuang (1821-1850). Size: 3 1/8" high x 7" wide. 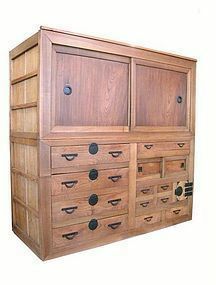 Antique Japanese 2-section futon tansu, made with chestnut wood frame, keyaki (elm) wood drawers and slider panels, sugi (cryptomeria) wood interior, iron hardware, top section has been converted into an entertainment center with shelves for components (can be removed if desired), small safe box compartment with key and two small drawers inside, Meiji Period (1868-1912). Size: 68" high x 68" wide x 30" deep. 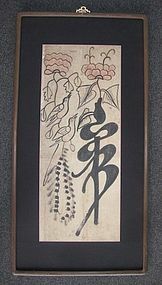 Antique Korean Ideograph Panel painted in sumie ink and reddish mineral pigments. 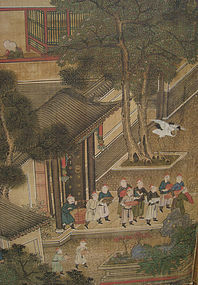 Depicting one of the four virtues of Confucian morality; Benevolence, Duty, Honor, and Humility. Charmingly rendered as folk drawing with bird and house with stylized character. Overall size: 18.75"W x 36.75"H, picture size: 12"W x 27.75"H. Chosun Dynasty, 19th century. 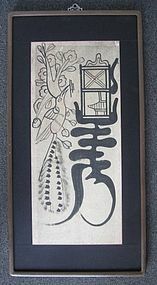 Antique Korean Ideograph Panel painted in sumie ink and reddish mineral pigment. Depicting one of the four virtues of Confucian morality; Benevolence, Duty, Honor and Humility. Charming folk drawing with birds and flowers and stylized character. 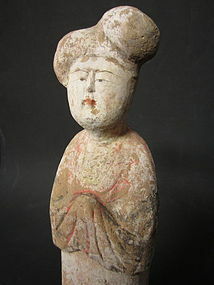 Overall size: 18.75"W x 36.75"H, picture size: 11"W x 27.75"H. Chosun Dynasty, 19th century. 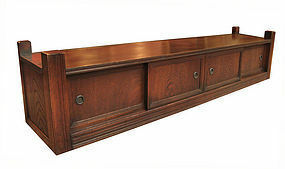 Antique Japanese okidoko (shelf for tokonoma), for Japanese display and storage, made all of keyaki (elm) wood with beautiful grain, 4 sliding doors open to one large compartment, pulls for sliding panels have raised motifs of flowers and waves, Taisho Period (circa 1920). Size: 14" high (12" high to top surface) x 63 3/4" long x 13 1/4" deep. 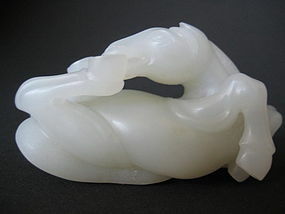 Chinese white jade rollicking horse animatedly carved with nostrils flaring and lying on back with hooves up in air. Size: 3 inches long 1.5" high. 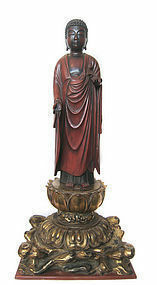 Beautiful large Japanese standing Amida Buddha, finely carved wood with red, black and gold lacquer, flowing drapery. Standing on base carved to look like rock and lotus and painted with a gold lacquer, inlaid glass eyes. Early Meiji Period (1868 - 1912) Size: 42" high x 19 1/4" wide x 14 1/2" deep. 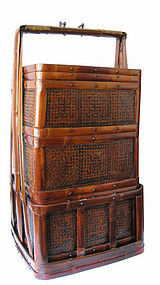 Large Chinese basket, tall stacking carrying basket, made of bamboo with iron handle, three compartments, outfitted with removable glass top so that it may be used as an end table or stand, the basket has a large character on the top and woven patterns on all sides, the tiered basket sits in a large bamboo frame with handle, Republic Period. Size: 37" high total (30 1/4" high to top of stand) x 18 1/2" wide x 18 1/2" deep.